According to LanceArmstrong.com, the brand of chamois butter Lance (newly proclaimed best male athlete in the world) was using but refused to name in episode one of The Lance Chronicles was Assos Chamois Creme. At $17 to $18, it's pricey. 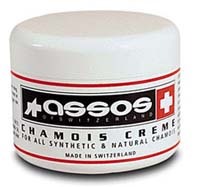 However, for long rides, some type of chamois creme is indispensable. Not just for comfort, but to prevent saddles sores. I've never had a saddle sore, I think, but the name of the condition is frightening enough. Cold sore, canker sore, saddle sore...the only word more horrific in the medical lexicon might be boil. Saddle boil. Ooh. Still, chamois creme, or butter, if you prefer, iss no substitute for conditioning one's derriere that's more effective than a lot of miles on the bike. Or perhaps one should just wet oneself?